One of the more surprising trends in Spanish speaking television is the ascendance of Turkish dramas in Latin American markets. Even countries like Chile and Argentina with a strong tradition of fine domestic telenovelas are finding imported Turkish productions at or near the top of their nightly ratings. The trend finally seems to be reaching our screens with five hours of Turkish programming a day split between Telemundo and MundoMax. It perhaps needs to be stressed that these Turkish dramas are not telenovelas or soap operas. Rather, they are weekly dramas with episodes typically lasting 90 to 120 minutes that are telenovela-ized for Spanish speaking markets: dubbed into Spanish and edited down to 43-45 minute episodes to be run daily. Needless to say, this is not the ideal way to view these productions. Telemundo seems to have hit upon a satisfactory compromise in its 12 p.m. ET broadcast of the 2010-2012 Turkish series Qué culpa tiene Fatmagül? (Fatmagül'ün Suçu Ne?) by airing two hours daily, meaning their broadcast more or less corresponds to a single episode of the original Turkish broadcast. This seems to have preserved the end of episode cliffhangers from the original, though Telemundo is trimming some scenes in each episode to fit it in the time slot. Frankly, Telemundo’s minor edits are not necessarily a bad thing having watched some of the original version of Fatmagül and finding the pacing occasionally verging on the glacial side. The long episode running time is too often filled with the padding you see in low budget movies from the 1950s and 60s. Characters never seem to just arrive at a location. No, the audience sees the characters get into their car, drive, arrive at their destination, park, exit their car, walk up the house, knock on the door, wait for the door to be answered, etc. Indeed, the lethargic pacing of Fatmagül takes some adjusting to, but it’s well worth the effort. It seems Fatmagül is the most popular Turkish series airing in Latin America - only the crime drama EZEL appears to rival it in popularity among Turkish imports – and it’s not hard to see why. There is a familiarity in the plot, character types, and themes that would be at home in the hoariest Mexican and Venezuelan telenovelas of the 1960s. A beautiful, noble, poor, orphan named Fatmagül living in a small port town is days from marrying a fisherman when she is raped by three rich young men visiting the town for an engagement party. A fourth young man, a poor, noble blacksmith who lives in the town and is a friend of the three rapists, is also present at the scene of the attack but does nothing to prevent it. The families of the rich men conspire with the wicked sister-in-law of the raped girl to convince her not to press charges against her rapists and instead marry the blacksmith in an eye roll inducing plot contrivance. Needless to say, after much animosity, the girl eventually falls in love with her forced husband. What lifts Fatmagül beyond the clichés and plot contrivances, aside from the considerable sheen of its beautiful, exotic setting and fine production values, is its attention to detail in its characterizations. The character types are clichés, but they are so enriched by an accumulation of detail and emotion that they eventually become more complex and interesting. This is helped considerably by the fine performances of the two leads: Beren Saat as Fatmagül and Engin Akyürek as Kerim, the blacksmith who marries Fatmagül. While I find Fatmagül an often frustrating series, it’s also one of the best to air on the Spanish language networks in the US this year. Audiences wanting more of Fatmagül star Engin Akyürek are in luck as his most recent series, titled for Spanish markets Amor de Contrabando (Kara Para Ask), premieres tonight on MundoMax at 9 p.m. ET. Akyürek plays a police officer in this 2014-2015 crime drama who finds himself drawn to a millionaire’s daughter played by Tuba Büyüküstün after their paths cross due to a double murder. Amor de Contrabando is a mystery series, so I rather not spoil any further plot details, but from what I’ve seen the series looks promising. Tonight’s premiere of Amor de Contrabando means MundoMax will now be devoting two hours in prime time to Turkish series, which is not too surprising as the ratings-challenged network was the first of the Spanish broadcast networks in the US to put a Turkish series in prime time with its run of the beautifully produced, but interminable (seeming to rival the Ottoman Empire in longevity) Suleimán, El Gran Sultán. MundoMax is rerunning that series weekdays at 4 p.m. ET. Suleiman himself, actor Halit Ergenc of the balding pate and penetrating eyes, stars in MundoMax’s other prime time Turkish drama, Las Mil y Una Noches (Binbir Gece), airing weeknights at 8 p.m. ET. Very loosely inspired by the frame story of the Thousand and One Nights (Arabian Nights), which at least allows generous usage of Rimsky-Korsakov on the soundtrack, Ergenc plays Onur, the wealthy owner of a construction company who hates women. Sehrazat, played by Bergüzar Korel, an architect who works for Onur, asks him for a sizable loan. He agrees to give her the money if she will spend a night with him. Desperate, she eventually agrees. Onur later learns the reason Sehrazat needed the money was to pay for the treatment that saved the life of her son who suffered from leukemia. 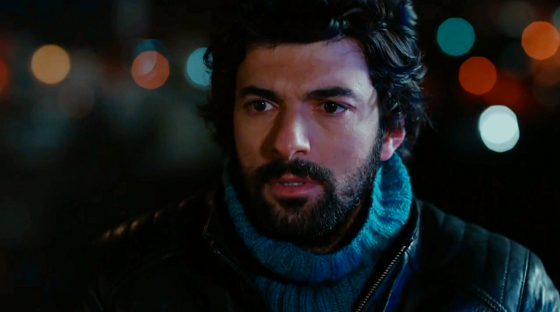 Onur falls in love with Sehrazat and attempts to woo her, promising her son would no longer ever be in need. This series was very popular in Chile and Argentina, but I confess I’m having a hard time getting into it. The Spanish dubbing leaves much to be desired and makes one appreciate the fine job Globo out of Brazil does in their Spanish dubs. The close ups on Las Mil y Una Noches are often held for an eternity, and while Ergenc and Korel have faces that can hold those close ups, you really wish they’d just get on with it. R.G. Morin writes a regular column for We Love Soaps, "Telenovela Watch: A weekly look at the world of telenovelas for non-Spanish speakers." For feedback or questions, you can email R.G. Morin at argeemorin@hotmail.com. Telemundo ha hecho el ridiculo en poner una novela como Fatmagul a las 12 del medio dia cbe que a esa hora nadie la ve porque es hora de trabajo o escuela. Igual hicieron con " Preciosa Perla", ganadora de un Emmy Internacional, ya que quieren poner en horario estelar las porquerias que ellos hacen, que ninguna tienen nada bueno que ensenar. Tienes toda la razón, lo que sucede es que Fatmagul es una serie que dura originalmente casi un año, por eso la dieron 2 horas porque en horario estelar sería muy larga y además es una serie demasiado fuerte para horario en que a lo mejor hay chicos despiertos. Preciosa Perla también era del mismo tiempo casi 1 año. Fatmagül tiene más de 200 capítulos. Ojalá Mundo Max continúe transmitiendo series Turcas, pués estamos cansados de ver refritos mexicanos o colombianos llenos de violencia,drogas o prostitución.